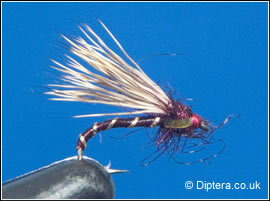 The half hog is a great fly in that it can be used as a static dry fly, emerger or sub surface fly. The beauty of this fly is that the deer hair wing makes it almost unsinkable when ginked heavily and the body tends to sit low in the surface film representing a natural. The body of the fly is either seals fur or a nymph / buzzer type body. To fish the half hog it can be fished static or twitched as a dry fly, used as an emerger on a long floating line or pulled subsurface. This fly is very effective and it is very rare that one fly will fit so many situations. NB. Make sure you use the finest deer hair possible when tying in the wing.